The Arctic Coastal Dynamics (ACD) project started in 1999 as an initiative of the International Permafrost Association (IPA) and the International Arctic Science Committee (IASC). ACD quickly developed a vibrant international community of scientists carrying out research in the Arctic. Significant contributions to International Conferences on Arctic Research Planning (ICARPs), to the International Polar Year (IPY) and to Arctic Observing (SAON, AOS) were the result. The State of the Arctic Coast report in 2012 was the culmination of much of this work and demonstrated how the project seeks to integrate research across disciplines and stakeholder groups. The year 2015 marks the beginning of a new phase of activity, initiated by a group of young researchers and beginning with the meeting described below. We welcome the participation of new researchers and groups in the project. Arctic continental shelves comprise 30% of the area of the Arctic Ocean and contribute about 20% of the world's continental shelf area. This extensive circum-Arctic coastal margin, about 200,000 km long, is the interface through which land-shelf exchanges are mediated. 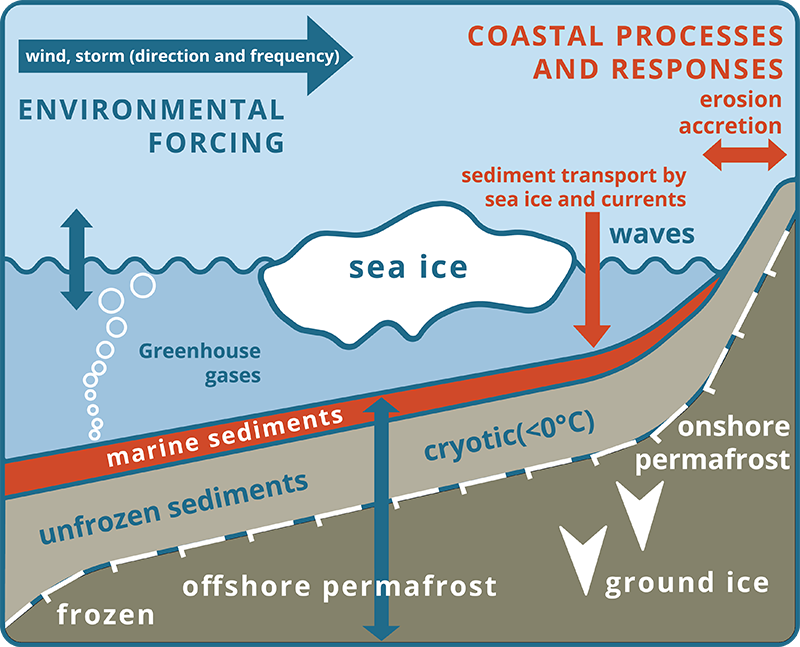 Sediment input to the Arctic shelf resulting from erosion of ice-rich, permafrost-dominated coastlines may be equal to or greater than input from river discharge. Determining sediment sources and transport rates along high latitude coasts and inner shelves is critical for interpreting the geological history of the shelves and for predictions of future behavior of these coasts in response to climatic and sea level changes. Figure 2. The human dimension of the coastal zone.